I have seen a lot said about Kodu over the past few months and I have to admit to say that I have had little faith in it would be a severe understatement. I have attempted to use many graphically powered programming languages in my life so far and without fail every single one of them has been a complete and total failure. So when this was first announced I looked on it as a play for PR points and not a real application. Well it looks like I may have to take a second look at it now as it is about to hit the marketplace and it may even work. Stephen Totilo from the MTV multiplayer blog was at Microsoft recently and was chatting to a Microsoft developer about how Kodu works. 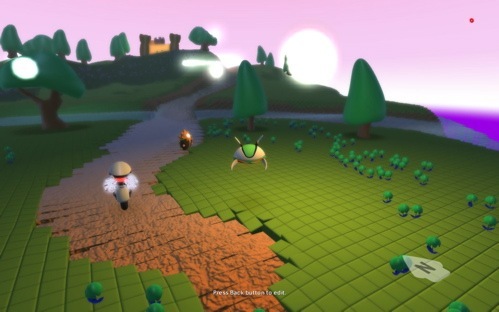 He then gave the developer, Matt Macluarin, a gaming idea that he has had previously and Matt went and used the Kodu interface to create a prototype of the gameâ€¦ in 10 minutes. Yes in less than 10 minutes Matt was able to create a functioning game based on the gameplay idea that Stephen hadâ€¦ granted the game sucked in the end but only because the idea wasn’t really very good and Matt only dedicated 10 minutes to it. The way Kodu works is that you create your application using rebuses, which are picture based sentences. I am not entirely sure how that is going to pan out but apparently it’s going to be so easy that a child will be able to do it and if that is the case I am putting my kids to work as soon as it is releasedâ€¦ you never know I may have a gaming prodigy on my hands here. Oh and the game idea was that everytime an enemy died it’s life force would be spread across the remaining enemies so that when you start the game it’s easy and it would then progressively get harder and harder until you are left with a random super boss characterâ€¦ it’s not the worst idea I have ever heard to be honest. Next article Duke is back… am I the only one who feels this is wrong?